26x day/night camera delivers uncompromised functionality and performance. 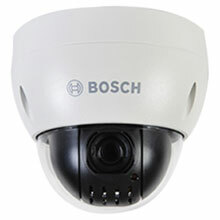 The Bosch VEZ-400 Mini PTZ Dome delivers uncompromised functionality and performance at an affordable price. The compact camera is only 4.4 inches (11.2 cm) in diameter""70% smaller than traditional PTZ domes""but packs a host of advanced features. Ideal for discrete surveillance, the VEZ-400 Mini PTZ Dome is available in charcoal or white. It is a perfect fit for small spaces or retail shops, schools and small-to mid-sized corporate offices, among other applications. The Bosch VEZ-423-EWCS is also known as BOS-VEZ423EWCS	or VEZ423EWCS	.